When you are choosing between all of the different oak flooring finishes available, it can be easy to get overwhelmed with all the options. As production and manufacturing methods improve, there are more options available for the oak floor boards themselves; from solid oak flooring to engineered oak flooring and boards of different widths and different thicknesses, several choices to make before you even begin to look at which finish you will select. More and more often, people want to style their home in classic and timeless furnishings and accessories, especially in the more considered investments such as flooring. Our customers have often asked us which finishes are more timeless and that will look as in-style in ten years as on the day it is installed in rooms like hallways and nurseries. Choosing a classic finish for your oak flooring ensures that you will get the maximum amount of wear from your floor and that if you choose to change the furniture or décor in your home, the floor will seamlessly blend with any changes made and will not need to be a consideration factor when you are deciding which changes you want to make. Before you decide which finish you want for your flooring, it is important to consider the type of flooring you will choose for your home as some finishes are only available in solid or engineered oak floor boards and vice versa. If you have your heart set on having underfloor heating, your finish options will be limited to those finishes that are available on oak flooring that is suitable to be installed over underfloor heating. The same applies for solid oak flooring – if you want only solid oak flooring in your home, you will have a selection of finishes that are available in solid oak flooring that might not be available in engineered oak and there may be some engineered oak flooring finishes that are not available for solid boards. 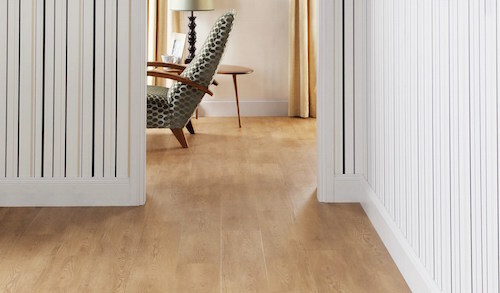 We have a range of helpful guides available to help you make an informed decision about which type of oak flooring will be best for your home, as solid oak flooring and engineered oak flooring behave slightly differently in different environments. Also, if you have decided that you want to install underfloor heating in your home, you will be selecting engineered oak flooring that is suitable for installation over the heating system. If you are considering underfloor heating, Oak Floors Online have developed a pioneering new underfloor heating system, ThruFlow that not only looks great installed but can also save you money on your household heating bills; you can read more about ThruFlow here. Once you have decided which type of oak flooring you are going to install, you can then look at the different finishes that are available. We always suggest that you take advantage of the free sample offer that we have, so that you can order samples of your initial favourite oak flooring finishes before you commit to ordering a particular finish. By ordering free samples, you can see the finish of the flooring up close and you can place the sample in the room(s) that the flooring will be installed in and see how it works with the existing furniture and how the light catches it at different times of the day. You might find that what was initially your second or even third choice of finish becomes your first choice after you see it in the room. Another benefit of ordering samples of the different finishes of oak flooring that you are considering is that if you are in a new home or are making big changes to your décor and interiors, you can take the sample with you when you are looking at paint colours, new furniture and accessories to see how they work together. We think that the majority of the finishes that our oak flooring is available in will stand the test of time and will look great in several years in the same way that it does now, however some styles of finish do have a more classic appearance than others. Our most popular and by far most classic finish is our brushed and natural oiled finish. This finish is available in solid oak flooring and engineered oak floor boards, so whichever type of flooring you are choosing, you can install a brushed and natural oiled finish. The brushed and natural oiled finish is created by ‘brushing’ the face of the planks during manufacture, which removes the slightly softer fibres of the oak. After the oak has been brushed, it is oiled with a natural coloured waxoil, creating a durable finish to the oak flooring. After the waxoil is applied to the oak face, the brushing that occurred during its manufacture enhances the grain features of the natural oak, resulting in a slightly textured and natural looking ‘oak-like’ surface. The manufacturing process of the brushed and natural oiled boards is the reason that this finish is a more classic style – subtle detailing with neutral colours work together to create a timeless look. You can also refinish a brushed and natural oiled floor without any difficulty, maintaining the classic look at its best with the correct care. We have a full range of care and maintenance products available to order here to help you to make the most of your oak flooring. For a classic finish and style of oak floor in the texture of the board itself, any of our hand scraped finishes will fit the bill. There are darker finishes available for the hand scraped board options, including our hand scraped vintage oak flooring, which is a darker colour than the other hand scraped finishes yet is still classic in its appearance, however is more suited for people who prefer a slightly richer appearance to their flooring. The replication of the finished effect that was produced by old manufacturing processes gives a beautiful texture to the floor board and is classic in its authentic appearance, making it a very popular choice with people who are looking for a classic finish.